We stock 3 major material types for our memorial plaques which are Welsh Slate, Sandstone and Marble should other stone be required such as Portland or York Stone be required, please contact us. We are adept at copying logos, coats of arms and military regimental insignias. Natural Rigged Edge, Smooth Straight Edge, Round, Oval, Square, Rectangle etc. You can find out more about our memorial plaques by clicking the links below. 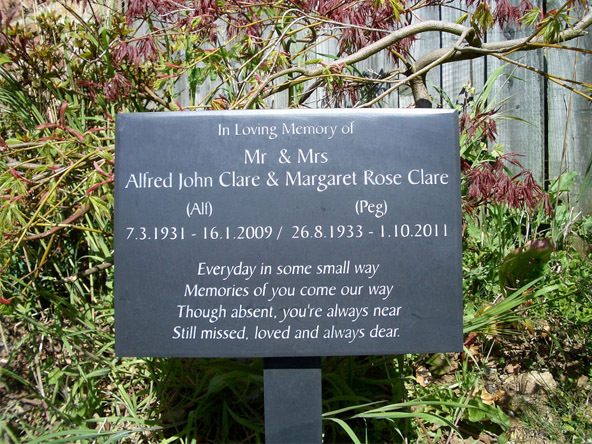 We at People’s Tribute have provided literally thousands of customers with high quality memorial plaques ideal for all private remembrance gardens, natural burial grounds, cemeteries and most church graveyards. 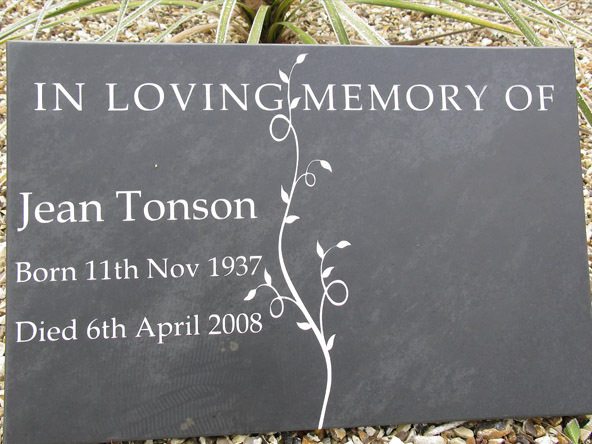 Established since 2005 we have provided thousands of customer memorial plaques. We use a good mix of modern and old techniques to ensure that your product looks great, is durable and will display your loved one the way you want too. If you plan to place your stone on land you do not own, it is a good idea to contact the owner to be sure they will allow the type of stone that you require. Check online to see if they have a website that lists their regulations, or if not, a phone number you can call to let them know your plans. We offer both regular and irregular plaques in various stone materials. Regular is more of a modern approach while irregular is more natural and rustic looking. Each stone piece is individually chosen to present a beautiful and pleasing shape, and like all of our stones, it will be unique. Sharp edges are smoothed so that you or any animals are protected from harm when coming into contact with the edges of the stone. Thickness ranges from 15mm to 30mm (please ask us if you require thicker stone). Sandstone is lighter in colour than slate, and the beautiful grain of the stone is carefully preserved when the plaque is made. 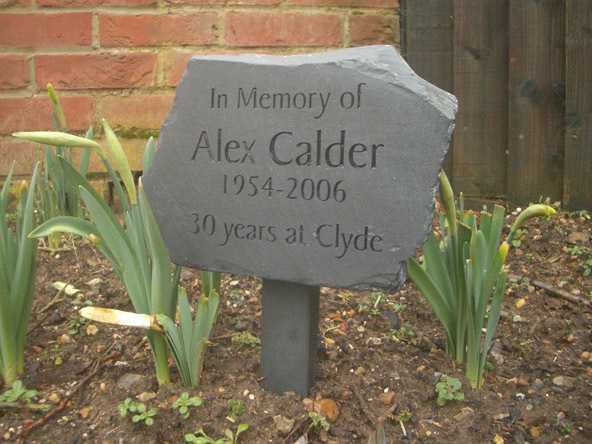 We support a range of stone plaques, from marble to welsh slate. Below you can view all the types that are currently available. 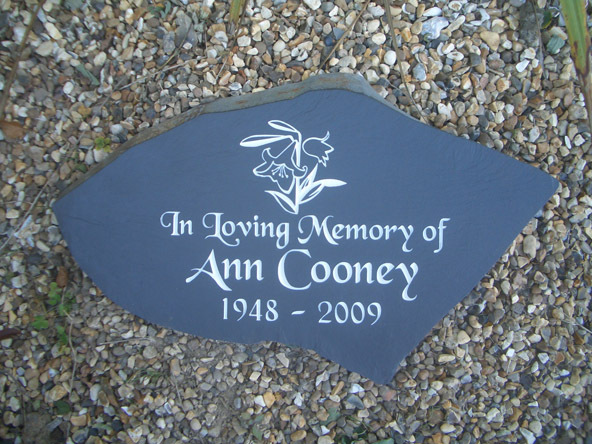 Welsh Slate memorial Plaques are our most popular sold stone because they look absolutely fantastic when engraved on, long-life durability, and minimal if any upkeep maintenance required. We use quarries in Wales and rest of the UK when sourcing slate. 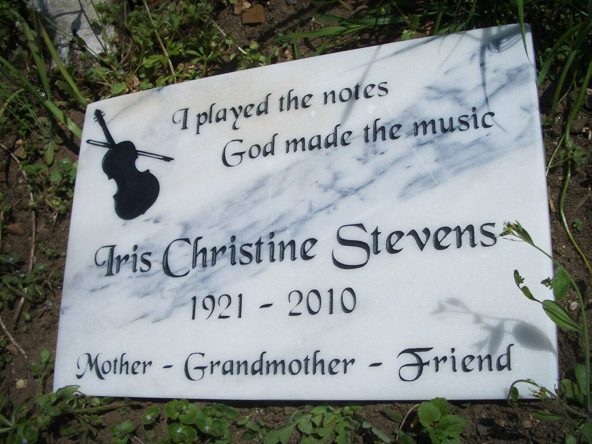 Marble memorial plaques display the elegance that established this stone as a traditional tribute to loved ones. The sheen, delicate colours, and lovely grain patterns make marble a prized stone. It is no wonder history’s great sculptors chose it for their artistic visions. As with all of our stones, we hand select each piece for unique grain, colours, and structure. 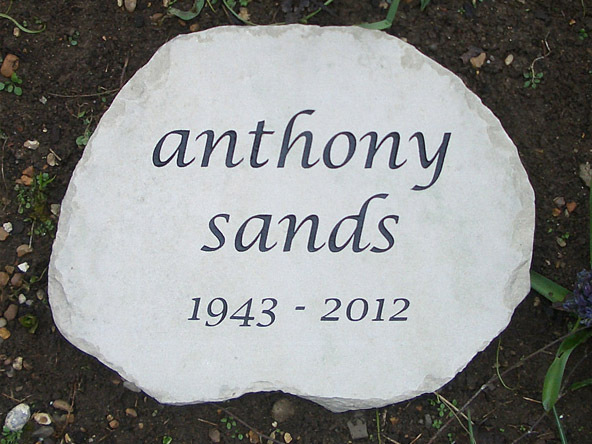 Sandstone memorial plaques present a beautiful and unusual look as a choice to memorialise a special person. A plaque is quite different from our upright stones. They are smaller and weigh less, and are easily mounted on a stand, a wall, or laid flat onto the ground. We spent a lot of time finding the best sources of sandstone, and as with our slate, we hand select each piece for its particular colour and beauty. Plaque sizes range from 200mm x 200mm, up to 900mm x 900mm. Larger sizes can be provided upon request. Feel free to contact us about your need for a different size of plaque, and we will be happy to work with you so that you can get exactly what you want. All our stones are already millions of years old, and these plaques will outlast any of us here now. Maintenance is low, such as simply brushing off leaves and dirt. We use only the most durable paint in the engraving. However, over the passage of years, paint colour may fade due to UK weather and sunlight. We will advise you what paint to use for touch up, and it is commonly available in home DIY stores. Click the Buy Now button on the right side of the page when you feel ready to create your very own memorial plaque. This link will take you right to our custom design program which lets you select from dozens of fonts and images. The size of the plaque stone is the only limit to what you can have engraved on it. If you want us to use your own custom image on the plaque, we can also do that for you. Just send us your image. If you have any questions or require some help, or you have decided you would like us to design the memorial plaque for you, don’t hesitate to call and we will give assistance where able.